Your BendPak lifting solution is the very best ​auto lift money can buy. Make sure it stays that way with BendPak's Car Hoist Inspection service. As an employer, you want to give your employees the safest and healthiest workplace environment possible. It's not only your duty as a business owner, it may be prescribed by your regional building and safety offices or workplace safety agencies. Non-compliant businesses are easy targets for negligence-based tort suits. If you don't keep up with recommended routine maintenance schedules, annual inspections and proper repair/service documentation, you can be shown to be liable in court. 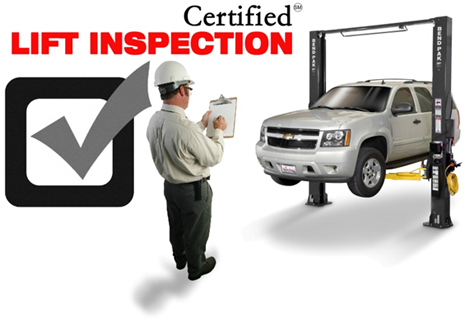 Annual vehicle lift inspections conducted by a “qualified automotive lift inspector” are required by the ANSI National Standard covering vehicle lift operation, inspection and maintenance (ANSI/ALI ALOIM: 2008). Inspections are also included by reference in regulations in the United States and Canada. We strongly urge you to contact us today to schedule an appointment with one of our lift inspection experts who will take care of everything. Protect your personnel, your property and yourself by taking advantage of BendPak's Car Hoist Inspection Service. No one knows how to take better care of your BendPak. BendPak's professionally trained inspection crews can provide you with valuable service records for each and every one of your BendPak lifts. We'll keep your files up-to-date and in compliance, so you can get back to what you do best—running a successful business. Repair records, serial number and model number clarifications, as well as third-party certification documentation, all fall beneath the umbrella of BendPak's total-package service. Remember, these records are an absolute necessity in the unfortunate event of personal injury claim or when needing to file a warranty claim on your lift. Too many businesses overlook detailed service and maintenance records until it's too late. Call us today at 1-800 777 318.